New Norfolk NEWS: Supermarket start "soon"
Preparatory site works including soil testing and an archaeological survey had recently been completed. Nothing of significance was found during the archaeological investigation of the building site. Construction of the new supermarket was due to be under way "soon". Similar supermarkets had been completed in six months once construction had started. 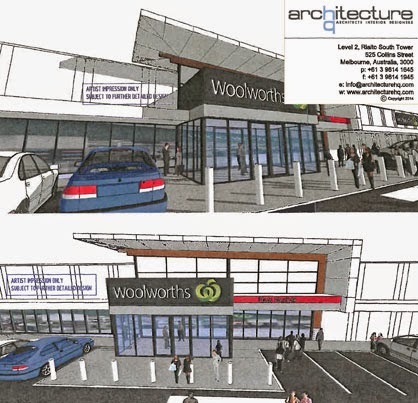 Woolworths was seeking to change the location of one of the driveways into the site. Understood to be worth about $15 million, the project will see a large new supermarket built on the former Royal Derwent Hospital/Willow Court oval. The location is on the corner of George St and The Avenue, opposite McDonald's, but the supermarket will be on the eastern end of the site, closer to Charles St.
Just a little note Ed…..where are all those that were opposed to the development of McDonalds on the corner of Burnett and George Streets Re. noise, traffic, rubbish etc. when another development is going ahead on the opposite corner. Is it that some people in this community only want certain business to go ahead in this "our" town if it benefits them and not all who reside here.